We watch movies and TV or read novels about characters who DO SOMETHING for some reason. Character behaviour must inform the plot and vice versa. They are inextricably linked. Story is the sum of ALL its parts – character and structure. One cannot be more important than the other. We all know the writing adage ‘characters are what they do’. As consumers of storytelling, we want to invest in characters’ journeys. Those journeys may be transformative for the characters, or they may not. But at base level, if characters do not do anything, they become dull. Even a passive protagonist must be enabled to make some sort of decision by the end of the story (usually by another character’s actions!). Writers must not concentrate ‘too much’ on characters. Yet this is precisely what they do, as standard. They underestimate the importance of plotting. This means they end up writing their stories into a corner (at best) and have a lack of story in their scripts or novels (at worst). There is JUST NOT ENOUGH there by way of character behaviour. But what can we do about this? More, next. I like to break down story as a ‘problem’ that needs to be solved by the protagonist. I find this approach centres me and my writers … There is a PURPOSE to both the plot and characterisation and reminds us the two are linked. When we lose sight of this, issues with our storytelling can occur. It also helps us pinpoint where that ‘lack of story’ is most likely to happen. 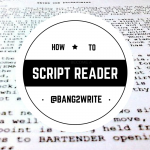 Over the years, I’ve noted about 80% of writers have problems with Act 2, for instance. This makes sense, because writers often concentrate most on stuff like Set Up and Pay Off. What’s BETWEEN that beginning and ending may get forgotten, or glossed over, even when outlining. In the past year I have been mentoring more Bang2writers than ever before on various initiatives, schemes and courses. This has lead me to revise and add to my original B2W model. The new version below is based on their feedback on what they need to get a handle on the ‘lack of story’ problem. As before, the Bang2writers’ work that helped inform this new pictogram was not just spec screenplays, but novels too. The idea is only that structure and plotting means ‘beginning – middle – end’ (and not necessarily in that order). At base level, it also follows the same notion of ‘protagonist has problem’ as well. You will notice a number of changes however, not least fact the story is ‘slanted upwards’ now. This is to reflect the idea of escalation or forwards momentum in the story. The protagonist’s actions are matched by the antagonist’s, to give us a sense of the character behaviour I mentioned earlier. I like to call the beginning or Set Up ‘The Kick Off’. It reminds us we need to hit the ground running, even if we do use slow burn techniques. The Showdown may be literal too, or it may not … But it still needs to be the the PINNACLE of your story. 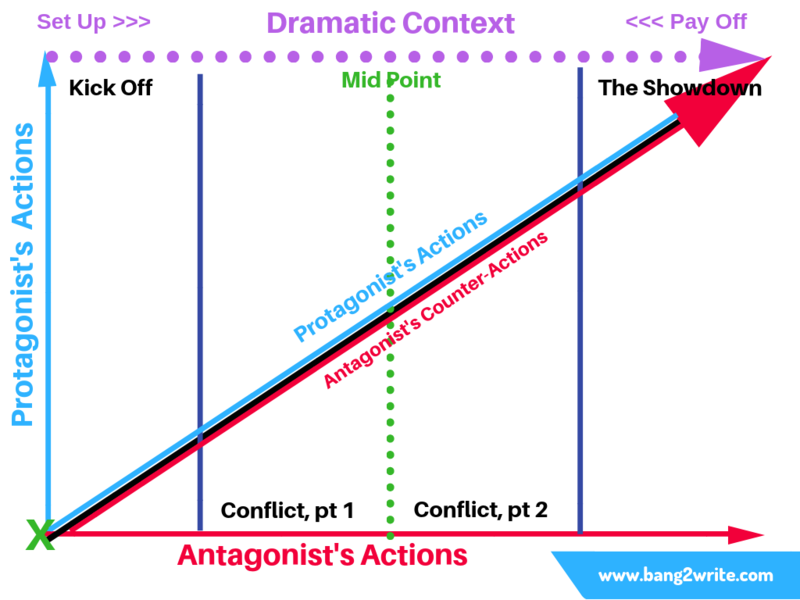 Dramatic Context is what takes us from Set Up to Pay Off … In other words from where a character starts, to where they end. As I have written before, in Horror and Thriller the Dramatic context takes our protagonist ‘flight to fight’ for example. Download the structural worksheet below. 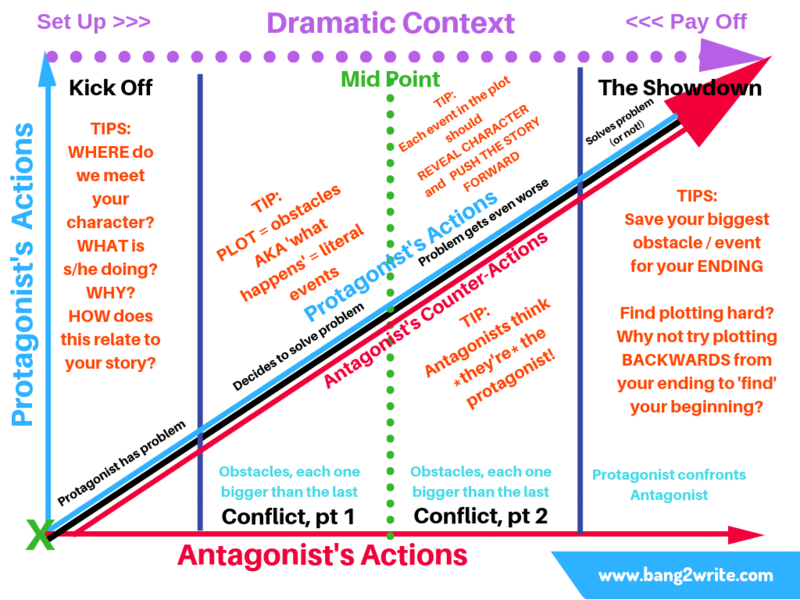 Plot your protagonist’s journey and how the antagonist gets in his/her way in the current draft. IDENTIFY where there is that ‘lack of story’. Think about the ACTIONS (behaviour) your characters can do to fill the void(s). Think about how your story ESCALATES. If you truly want your great characters to resonate, we need to be able to invest in their journeys. Don’t forget to download your new, FREE B2W structural worksheet. Enjoy! Download Your Free B2W Structural Worksheet by clicking on the icon below. You can also download this worksheet from The B2W Resources Page. Good luck with your projects! Helpful as always!!! Thank you.